Educational assistance for 56 children. School fees were paid for both elementary and high school students. Most high schools are boarding schools with students living at the school. 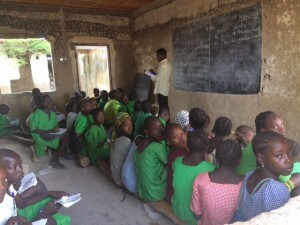 Thousands have been widowed by the Boko Haram insurgence and they cannot afford to send their children to school. The mothers are very thankful for the assistance. Medical help was given to around 400 persons. Adequate medical care is still unavailable without traveling long distances and then most cannot afford to pay for the care. EYN Disaster Ministry medical staff helped 5000 persons last year. 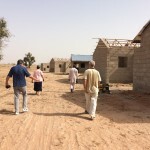 Please continue to pray for Nigeria and donations are greatly appreciated. 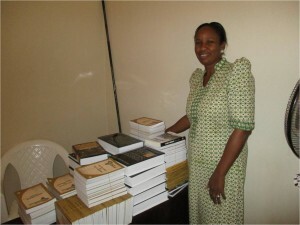 Education Must Continue Initiative (EMCI) is so thankful to God for another year. Our prayer is that , every one of you would enjoy a very exciting walk with the Lord through out this new year. We also pray that He will provide ALL your needs both spiritual and material according to His riches in glory by Christ Jesus. 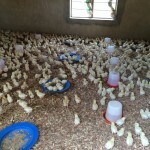 – Graduation of 59 IDP Yola senior class. 85% of whom passed their SSCE exams( SAT) equivalence. 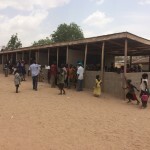 – Gradual stabilization of the Yola and Lassa IDP schools for better future directions and planning. 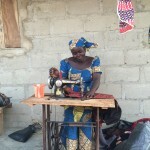 – One of the chibok girls that have lived with us has started her degree (Accounting ) program in AUN Yola. The other is preparing for her SSCE. Their determinations are very encouraging. -Amazing donation of nutritious food to EMCI kid by ALL THINGS POSSIBLE. It arrived very timely , at the peak of the food crisis in the Borno camps. Over 14000 kids benefited from it in Maiduguri and 6000 children, orphaned by Boko Haram and Fulani herdsmen violence. Thank you to everyone who supported the Nigeria Crisis work in 2016. It is amazing to see what we have accomplished together. May God continue to work among us. headquarters and many schools. 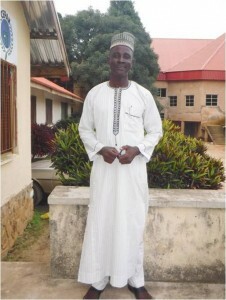 In Mubi the head of the school had lost her husband and Safiya prayed with her in her home. 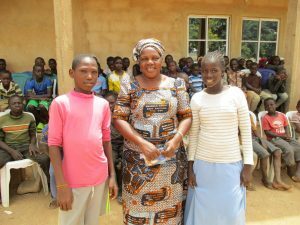 At the EYN Comprehensive (secondary) School she asked students to write an essay on how Boko-Haram has affected their education. In an attempt to reach Chibok her car was stopped from proceeding, but that didn’t stop Safiya. 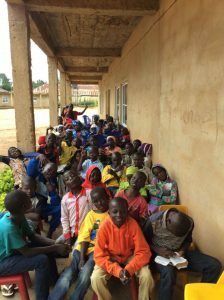 Telling her driver to stay with the car for his own safety, Safiya said, “I bought a box of water and started walking, wondering what I would say if I encountered any terrorists.” Upon arriving at Chibok she found that the school staff had not seen anyone from EYN for one year. They were greatly encouraged by her presence. workshop on trauma healing and vocational training in Yola in November 2015.
retired pastor and former collegue at ECWA seminary. In the midst of all the suffering and hardship, Safina sees God’s spirit working. • God has helped many people to escape. burned and some things were able to be salvaged. girls will have? How can they, with already lowered status, help their children? How can we prevent this from becoming an ongoing multi-generational tragedy? Weapon of War. She has plans to publish a book on the subject in two years. bringing inspiration and renewed faith to the church in America. In 2014, Zakariya Musa was pursuing his Bachelor of Science degree in Mass Communication at the University of Maiduguri. It was supposed to be a 6-year journey. He works for EYN Headquarters as the Editor of Sabon Haske, which is an EYN publication reporting on major events in EYN. The University of Maiduguri offered a program where he could travel to Maiduguri to attend classes on Friday evening and all day Saturday. He would travel earlier in the day on Friday to get to Maiduguri for the Friday classes, then travel on Sunday to get back to EYN Headquarters at Kwarhi. 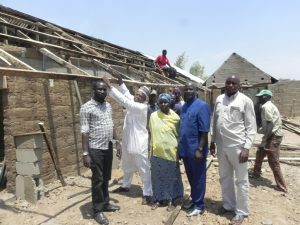 He was given study assignments to work on during the two weeks he would spend at EYN Headquarters before again returning to Maiduguri for the Fri – Sat classes, then back to Kwarhi again. Zakariya would work at EYN Headquarters during the day, and study at night. 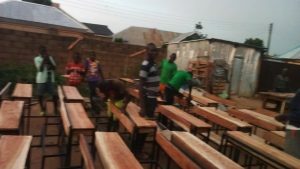 He has 8 children, so to get a quiet place to study, he would frequently go to the Library or the classrooms at Kulp Bible College (KBC) at night to study. It was a very busy life. But, this was a schedule he expected — before the Boko Haram insurgency geared up. Maiduguri is a very large city north of EYN Headquarters. If you travel on the road that goes north and is the shortest route, it takes about 4 hours. Soon, however, it became unsafe to travel the shortest road up to Maiduguri. Even today, because of the insurgency, it is not safe to pass on the road through Bama / Gwoza. Instead, travelers leaving Kwarhi must first travel to Yola which is about 4 hours SOUTH of EYN Headquarters. Then you have to travel from Yola to Numan, Adamawa state /to Gombe, Gombe state/ to Damaturu, Yobe State/to Maiduguri, Borno State, a further trip of approximately 10 hours through 3 state capitals. So, total trip time now become 14 hours one way. Getting his degree became very difficult as Zakariya continued to pursue it. Not only did the travel time increase so much that it became almost impossible, but the trip is not even very safe in some places like Damaturu. Another problem was that the city of Maiduguri imposed a curfew during this time to help ensure the safety of the city. Zakariya’s probem was that they kept changing the time. Sometimes it was 5 pm to 6 am, sometimes it was 6 pm to 7 am, and sometimes it was 7 pm to 7 am. Zakariya always called ahead to determine the time so he didn’t have to stay in the bush. He had to stay over night in Yola several times. But, Zakariya still persevered toward his degree. Then, to make matters worse, Boko Haram began an all-out effort to carve out a radical Islamic state in a section of northeast Nigeria. They weren’t having success in overcoming Maiduguri itself so their eyes moved toward its surroundings with a bomb blast here and there within the city despite the heavy military checkpoints at all road linkages. They began a march south, overrunning Bama, Gwoza, Madagali and Michika in mid September, moving into KBC on Oct 29 and overrunning Mubi on Oct 30. People were anxious all over the area, but didn’t want to abandon their homes and crops. They didn’t want to run away until they had no other choice. But, Oct 29th was that day for Zakariya’s family, who lived in Kwarhi near the EYN Headquarters. His older children abandoned their house early in the morning of Oct 29th by starting their trek, on foot, toward Gashala, then Hong, then Gombi, before getting transport to Yola. Unfortunately, Zakariya’s wife didn’t leave soon enough. She got trapped in her home in Kwarhi. Thankfully, she was able to sneak out later in the day. 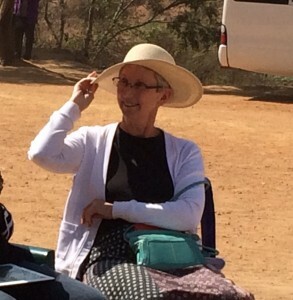 She went through the bush to Gashala, then Hong. She trekked about 15 miles before spending the night in Gashala. She and her group (which included a pregnant woman who was in her eighth month) were finally able to get transport from Hong to Yola. That same day, Zakariya had made the long journey back from Maiduguri and arrived in Yola the evening of Oct 29th. His wife arrived on the 30th. 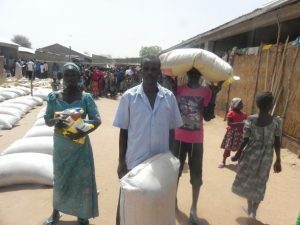 The pastor and parishioners of the Vinikilang EYN church, just outside Yola, were allowing displaced people to gather in a large open area near their church. Zakariya estimates that there were about 400 adults staying in this open area. Sometimes they were able to get one plate of food for the younger children. 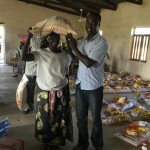 He had very little money with him, but was able to purchase a little food for the rest of them. They stayed there for 6 days. Ultimately, the displaced people there dispersed to many areas, wherever they could get a safe place to stay until they could return home. 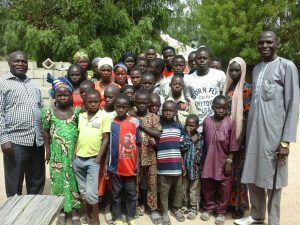 After discussing their options, Zakariya’s family decided to move to a refugee camp in Bukuru (near Jos) run by the Stephanos Foundation. There they stayed in a shelter which only had half walls. They decided to hang cloth around the open top half so they could have a little privacy. While working on his final project he got word from Gavva that his parents had been killedby the insurgents. 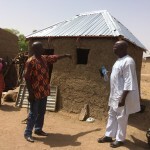 Gavva is one of the villages in northeast Nigeria very close to the Cameroon border where people are still afraid to go back because they are likely to be killed. Then, he then got word that his mother had been seen alive. But — he has now not heard from his mother for over 6 months, and he’s doubtful that this is really true. His father and mother lived in Gavva their whole lives, and Zakariya grew up there. The death of his parents has been a terrible blow for him. Zakariya thanks God for getting him through the difficult challenges of getting his degree. 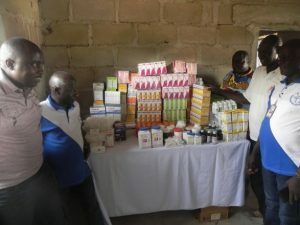 He is also grateful to Stephanos Foundation for helping to provide for his family during a time when he’s also mourned for his parents and the other colleagues he has lost to the Boko Haram conflict. When he reflects on what has happened to him he says he appreciates people, particularly in Jos, for their concern for EYN. His prayer is for peace to come back to Nigeria, especially in the northeast where the insurgency has taken over. He prays for God to give EYN a forgiving heart because we have all sinned before God. He prays for the new government of Nigeria under the leadership of President Muhammadu Buhari and for the betterment of all citizens. Phone Report from Cliff Kindy to Carl and Roxane Hill on Feb. 3, 2015. 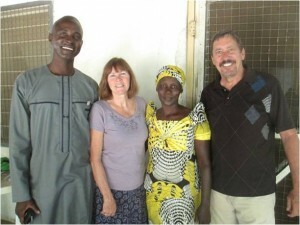 Cliff is currently a Brethren Disaster Ministries volunteer reporting from Nigeria. 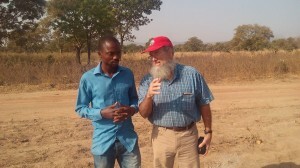 Cliff Kindy (right) volunteering in Nigeria. Photo courtesy of EYN Nigeria. Lastly, as most of us are digging out of the recent snow storm, Cliff is enduring 100-degree heat with failing electricity and fighting mosquitoes in humid east Nigeria – way to go, Cliff!